Get ATM Machine Price Quotes From Companies Near You for Free! No Wasted Time: Let us do the work for you. We can quickly find reputable ATM machine dealers in your area. No Commitments: There are never any obligations to purchase an ATM machine and our service is always free! No Uninformed Decisions: You will receive access to a detailed ATM Machine Buyer's Guide. An automated teller machine (ATM) will cost as little as $1,000 or as much as upwards of $25,000. 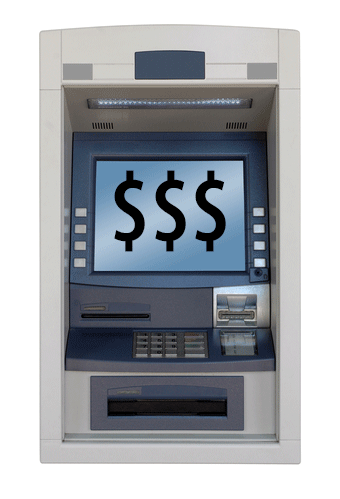 Leasing or renting an ATM has an average cost between $50 and $120 per month. Some vendors choose to waive monthly leasing or rental fees in high traffic areas and charge a portion of the machine's surcharges instead. Generally, the cost to rent or lease an ATM averages between $50 and $120 per month. Installation and training fees have an average cost between $50 and $500, but these fees as well as rental/leasing fees may be waived in high traffic locations in exchange for a portion of ATM surcharges. You need to maintain a phone line for the ATM, which has an average cost between $20 and $40 per month. Statement fees have an average cost of $30 per month and replacing receipt paper can cost as much as $50 per month. A professional cash loading service generally costs around $50 per trip. If you hire an armored truck service, expect to pay between $100 and $500 per month. 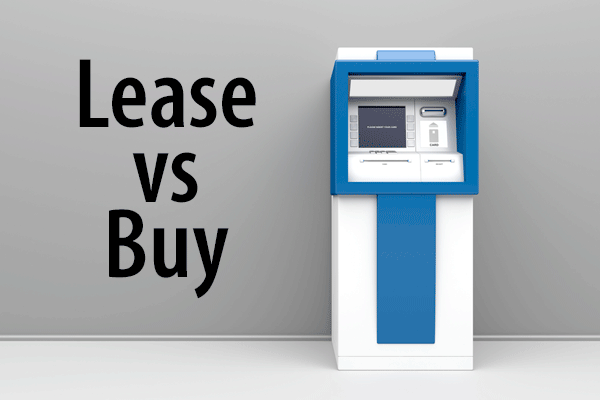 Prices for renting or leasing an ATM depend on the type of machine you get, the duration of your rental/leasing agreement, the foot traffic at your location, and your restocking method. Some rental and leasing agreements stipulate that the owner is responsible for maintenance and servicing, while others place that responsibility on the renter. Be sure that you fully understand everything in your contract before signing. Renting or leasing an ATM comes with pros and cons, with the right move for you depending on your particular situation. Cost: Renting or leasing an ATM comes at a much lower upfront cost, which may even be as low as zero. If you do not have the capital to purchase a machine outright, this is a great way to get what you need without breaking the bank. Commitment: Choosing to rent or lease means a shorter commitment to the ATM. It is a way to see if having an ATM on site is worth it for you without having to purchase one. If you find that it does not work for you, simply send it back at the agreed upon time. Long-term costs: While renting and leasing definitely provide lower upfront costs, over time you almost always pay more. It may not seem like it because payments are spread out over months, but interest and other fees add up over the course of the rental/leasing agreement. Lack of ownership: Unless you buy the ATM outright, you do not actually own it. This means you have less control over everything from servicing, to surcharges, to placement. Be sure to understand who is responsible for what as according to the agreement. The cost of buying an ATM depends on the type of ATM you choose, the age of the unit, and how you choose to restock the machine. Most standalone ATMs have an average cost between $3,000 and $5,000. Used models have an average cost around $1,000. Countertop models have an average cost around $1,500. Heavy duty ATMs designed for outdoor have an average starting cost around $10,000. A phone line for the ATM has an average cost between $20 and $40 per month. A professional cash loading service costs around $50 per trip and armored truck services have an average cost between $100 and $500 per month. Replacing receipt paper has an average cost of $30 per month. Don't forget that owning the ATM means servicing and maintenance costs are your responsibility. It is often recommended that you consider an extended warranty or protection plan. Just as with renting and leasing, buying an ATM comes with advantages and disadvantages. Long-term costs: Think of renting or leasing like a loan; you pay a little extra to spread your payments out over time. When you purchase, you pay only for the cost of the machine. Ownership: Buying gives you complete control over the ATM, meaning you set the surcharge, decide where it's placed, and how often it gets refilled. Maintenance: While owning the machine is nice and gives you control over when and how maintenance takes place, it also means that those costs come from you. Don't forget to budget a little extra for maintenance and repairs. Upfront costs: You pay less overall when you buy, but an outright purchase is a significant investment. You spend far more upfront when you buy in comparison to renting or leasing. An ATM that is not owned by a federal or state agency has a different set of rules and regulations to follow that vary depending on your state. Non-banking ATMs only allow for the dispensing of cash; no deposits are allowed. These machines must also have some type of logo or identification that lets potential users know whether their card will be accepted. Owners still have the ability to impose a surcharge so long as it is disclosed to the customer by a sign on the machine and electronically by the machine itself. Any institution that operates an ATM needs to comply with federal and local laws, most specifically the Federal Electronic Funds Transfer Act and the Bank Protection Act. But it is important to note that these laws provide security for the machines themselves, not the user. While there are no federal laws for minimum standards to protect ATM users, several states have passed their own laws in regard to what security precautions must be taken. Before buying, leasing, or renting an ATM, be sure to check your local and federal laws to ensure that you are fully compliant.